A member has reported a problem with the freewheel unit in his 95 V4. After having the clutch replaced at 75,000 miles, the freewheel became erratic and was not clearing properly. After a few weeks it shattered. Upon inspection the nylon control sleeve inside had started to melt, the bronze fork was replaced and the gearbox rebuilt and a freewheel unit off another car fitted. One year and 3,500 miles later, the freewheel gave up again. In a 96 workshop manual the diagram of the freewheel showed a very similar set up. The freewheel transmits the power from the clutch shaft to the transmission primary shaft in the gearbox. 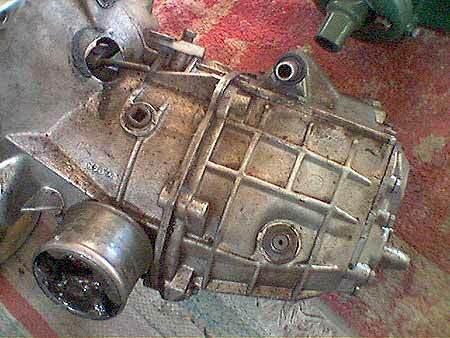 The mechanism is made up of the clutch shaft, driven by the engine, the freewheel hub splined onto the clutch shaft, with rollers, plungers and springs sitting in recesses in the hub, and the sleeve surrounding it. This sleeve is the front part of the primary shaft taking the drive into the gearbox. The freewheel hub has roller seats – each containing a roller. Each of these rollers are individually spring loaded, the springs constantly press the rollers into the curve shaped roller seats. [Early gearboxes had 6 rollers and 6 springs and plungers; later boxes (from transmission No114860) had 10 rollers and 20 springs and plungers]. As the drive is taken up, the freewheel engages through a ratchet effect. Because the freewheel hub rotates faster than the sleeve on the primary shaft, the rollers are forced up the curved roller seats in the hub and jam tight against the sleeve. When the rollers are in this position the primary shaft is forced to rotate at the same speed as the clutch shaft. 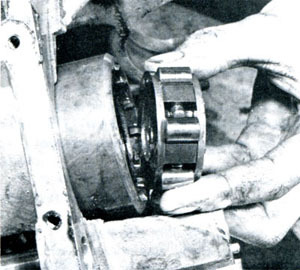 If the primary shaft (sleeve) rotates faster than the clutch shaft, as may occur when running down hill with the engine idling or slowing down for a junction, the rollers are released – that is, carried back into the deeper part of the roller seats thus the primary shaft is able to rotate freely letting the vehicle “freewheel”, allowing the driver to change gear without depressing the clutch. Rollers and plungers should be checked for wear and ensure the plungers move freely in the holes. Check there is no wear inside the freewheel sleeve. It is advisable, if fitting a used freewheel hub, that it should be stripped and checked for wear (check it is the later type). I can’t imagine that new parts are available (if anyone knows different please tell us). While the Saab driving and maintenance guide advises that it is possible to change down without using the clutch when the freewheel is in operation, with a little practice clutchless changes can be made up or down while on the move! “Drive as much as possible with the freewheel drive in operation,” the guide advises. In this condition it saves on fuel and engine wear. Only lock it out when you need to tow-start the car or utilize the engine braking when down hill driving on steep mountain roads – as long as you remember to stop at the top of the hill and lock the freewheel first. I forgot once, while travelling in Norway behind an army truck down a very steep hill – we had severe brake fade and a very close view of the rear of the truck!